Yes, the Dedes are back to normal. Unfortunately part of their normality is their struggle for survival. They don’t want to have anything for free, but for some of them it is very difficult. Look, for example, at Rob D Light. He has been looking for a job for ever and lives under a blanket of newspapers. His old one is ripped and he gratefully grabbed the discarded ransom note because it was glued on 120gsm paper. That will be a bit warmer than the thin newsprint in the approaching New Zealand winter. Mouse said Cool Cat should do some work to get noticed, but that is easier said than done. Mouse works relentlessly. She is a workaholic to be precise, but does she earn a decent income? No! 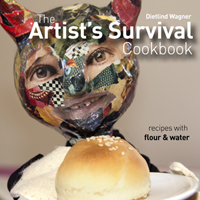 She has put together the Artist’s Survival Cookbook which is available in print, and just two days ago, she put the latest publication The Super Dede Competition as an ebook on smashwords. The problem is the marketing. Not one Dede is an expert at that. So, Mouse has taken charge of this now as well. She put the price on US$3.99, which for an ebook might appear a bit dear, but she argued it should be viewed as a donation to the Dedes. They don’t want to have anything for free, though it is obvious they can’t survive on thin air. “Look at it” she said defending her decision. “It is the price of a cup of coffee”. Then she went on to explain where the money is going. $1 from each book goes to Rob D Light and another $1 goes to L’Artiste so he can continue his carefree work. 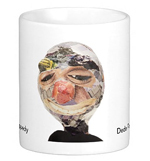 The rest that is not withheld by Smashwords for administration will go to repay debts the Dedes have accumulated in recent years. Originally she wanted to put it in the kitty for a rainy day, but no, it is better to get rid of debts first the others said. So here we are: click on the image, buy the book, donate to the Dedes and tell all your friends about it. The Dedes will be eternally grateful. i shall purchase this week coming :) good job, i need a mouse! The Dedes are still discussing how they are going to market the book. I shouldn’t say that, but there might be the possibility that it is free for one day, and one day only :). They will hate me for that, I simply can’t keep my mouth shut.